Aerohead 25: When push comes to shove, Aluminum can take it. The boat was rock-solid at any angle of attack, and the ride was much better than expected for a boat this size. Travis Brandt of Aerohead Boats is telling me I can do a hard-over turn at wide-open throttle with the boat running along at about 40 knots. The safety part of my brain is kicking in and telling me that hard-over at this speed isn't prudent. Heck, I've been aboard boats that don't do well in hard-over turns at 15 knots. So I throttle back a bit, and start a turn at 35 knots. As the boat digs in I grab one of the twin overhead bars with my left hand even as my right has a tight grip on the wheel. G-forces push me sideways, but the boat wants more. I turn the wheel tighter and tighter and the boat leans into the turn, carving a tight circle. No cavitation. No blowout. No spinning out of control or the hull breaking loose. Travis looks at me and sees the broad smile on my face. "If I don't get a customer to smile like that by the end of a test drive, I haven't done my job," he said. So much for remaining unbiased and professional. The boat is tough; 5086 H116 alloy is used in the hull construction. One-quarter-inch on the sides, 3/16 of an inch on the bottom. A proprietary hull design gives outstanding performance. The boat is designed on the computer, and then all the parts are cut out. "If any part is off by an eighth of an inch, we redesign the part," Brandt explained. The goal is to have engineered parts that fit precisely, avoiding the all-too-common weld on a piece and then trim it to fit. Compound curves forward give the boat a unique hull shape akin to a fiberglass boat as opposed to aluminum. "They said it couldn't be done — compound curves — but we have 747s flying out there that say it can," Brandt said. All we could find on test day was a 1-foot chop and some swells. Running over our own wake was not much help in displaying the boat's outstanding ride, as she produces almost no wake at high speeds. 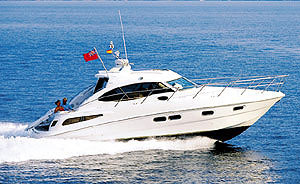 The boat was rock-solid at any angle of attack, and the ride was much better than expected for a boat this size. Gone are the bumpy old days we once associated with aluminum. 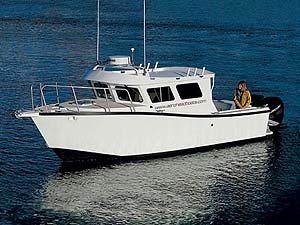 In fact, having a ride more in line with a fiberglass boat was one of Brandt's goals. "We're taking aluminum boat construction to an entirely new level," he said, pointing out that he hadn't originally set out to build aluminum vessels. "Most builders haven't changed what they've been doing in 20 years. It's primitive." New processes are available today to improve the boat's strength and reduce labor, making a better boat. If you're getting the impression that Brandt is passionate about these boats, you may be onto something. The boat is fast. By the time we stepped aboard, hull number 1 had been in service for eight months, and the Mercury Verado 250s on her transom bracket had more than 200 hours on them. The Verados fired up at the flick of the switch and quietly awaited a command. Engine information is on the SmartCraft gauge on the dash. It takes a little getting used to, but the amount of information available on the LCD display takes up much less space than an array of gauges would, and it's user-settable, so your favorite setup is available at the touch of a button. The engines want to go fast. Small increases on the throttle are difficult, and I found myself throttling back to get to the rpm I wanted. 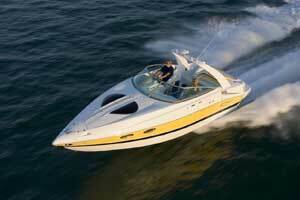 But the boat will cruise comfortably at 3,150 rpm, clipping along at a nice 21 knots. Four thousand rpm yields 28.5 knots, and 5,000 rpm gave us 36.5 knots. 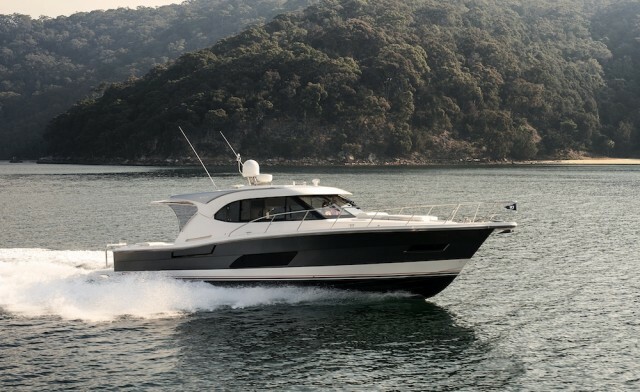 Of the five boats Aerohead has sold, four have the Verados and one has similarly sized Suzukis. "We installed the 250s just to show what the boat can do — just how far you can push her," Brandt said. 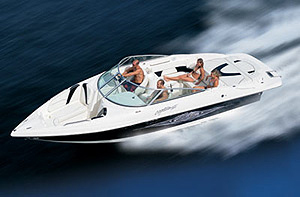 "I expected most boats to be sold with a pair of 120s to 150s. But once you get a ride with the big engines, it's hard to give up that ability to run really fast with comfort." The boat was comfortable, despite the fact that hull 1 has been so busy doing demo rides that some final touches haven't been completed. I was surprised to find that the foam insulation in the hull was one of these items, though. We were running the boat around 30 knots when Brandt mentioned that only the cabin top and the sides had any insulation in them at that point. Given the normal tones in which we were speaking — and what I'd previously thought about aluminum boats — this was impressive. Also impressive was that we needed to remove our jackets, even though it was around 40 degrees outside on test day. A kerosene Wallace 30D furnace kept us warm and also provided a defroster vent for the windshield. The Sea Glaze windows give excellent 360-degree visibility. I did find myself trying to look between the starboard and center windshields, which seemed a little obstructed, but Brandt told me that Aerohead's production boats have larger windows forward to open up the line of sight. In fact, changes that I thought would improve the boat after running hull 1 already had been incorporated into future boats. But the fact that there were very few kinks like these to work out shows how well-planned the boat was on the computer. The boat is ... pretty? "I didn't want a utilitarian interior like so many aluminum boats have. I wanted the boat to feel warmer, with softer tones inside," Brandt said. The interior surfaces, for the most part, are soft vinyls. This allows a layer of insulation in the cabin sides and top, and still maintains an easy-to-clean surface. Aluminum bulkheads are finished with Zolotone paint in creams and beiges. While our test boat had a very basic cabin arrangement, with twin storage boxes and inward-facing bench seats, the most impressive items inside are the forward-facing helm and companion seats. Because the boat is capable of so much, Brandt explained, we wanted a seat that could help the boat deliver, yet still be comfortable during the extremes of performance. Beginning with one of the best seat bases built by KAB of England, Aerohead tossed the seat itself in favor of installing Oregon Aero seat cushions. Oregon Aero builds seating for military equipment, including those used in Navy Seal vessels, Humvees and a little airplane known as the F-22 fighter jet. 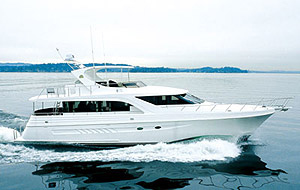 The boat's ride is solid and steady, and the hull is capable of running in some extreme conditions. The seats will keep the captain and the navigator comfortable in water other boats this size would never touch. 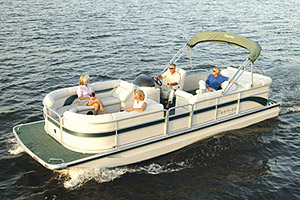 But this rough-and-tumble boat is really a softy, as the Aerohead 25 is also family friendly. "The boat is definitely a ?man' experience, but we designed her to be pleasing to the eye and soft inside to appeal to the entire family," Brandt explained. This nicely outfitted package is backed up with capabilities far beyond where you may be willing to push her — but Brandt showed us just how far we could go.